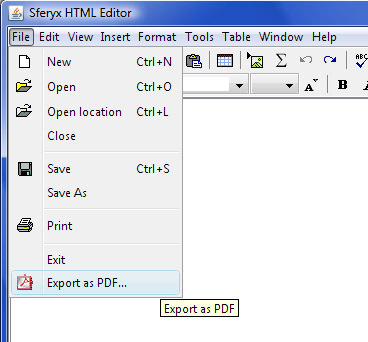 Sferyx PDF Export Add-on is an additional plug-in component for the Sferyx JSyndrome HTML Editor products family both Component and Applet Editions. It allows to export and save the entire content of the HTML Editor as PDF file easily and seamlessly without any effort both from the user and programmer's point of view. 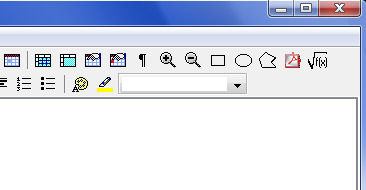 If enabled, the PDF Export can be used both like an icon on the editor's toolbar or menu item and programmatically as a component for generation of custom PDF files from the HTMLEditor. If allows to be specified the page format, margins etc. and to save the PDF generated to a file or to a given java.io.OutputStream. Support for all western Latin languages such as English, German, French, Italian, Spanish, Portuguese, Swedish, Norwegian etc. Support for Arabic, Cyrillic, Greek, Hebrew, Farsi, and many other languages through character set UTF-8 encoding and separately Chinese language is also supported through ISO-10646-UCS-2 charset. Automatic embedding of all TTF fonts contained inside the document when the UTF-8 encoding is used. Add custom Page Headers, Page Footers and Page Numbers in the resulting PDF file. It will cause the PDF Export icons to appear on the toolbar and the File menu as can be seen from the pictures above and below, allowing immediate generation of PDF files directly from within the HTMLEditor. This will produce a string like This is the Page Footer at the bottom of the page. You can set any HTML attributes and elements including images etc. to format the output as you need.. This will produce a string like Page 1 at the right bottom corner of the page. You can set any HTML attributes and elements including images etc. to format the output as you need. Will export the entire content of the HTMLEditor as a PDF document to the given stream. Will export the entire content of the HTMLEditor as a PDF document to the given stream with a given PageFormat. Once saved the pdf file, it can be also linked to the document for example by a hyperlink and after that it can be automatically uploaded through the built-in automatic upload feature of the HTMLEditor. The same is valid both for the Component and Applet Editions. <PARAM NAME="enablePDFExport" VALUE="true|false"> -this parameter enables the PDFExport Add-on if available - it will allow the generation of PDF file from the document which can be saved and linked to the document as a hyperlink target for subsequent automatic upload if needed. It will cause the PDF Export icons to appear on the toolbar and the File menu as can be seen from the pictures above and below, allowing immediate generation of PDF files directly from within the HTMLEditor.